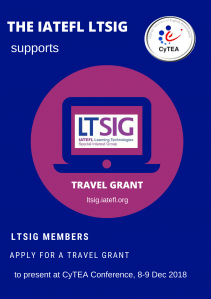 The IATEFL Learning Technologies SIG is pleased to announce a presenter travel grant for the annual CyTEA Conference to be held between 8-9 December 2018 in Nicosia, Cyprus. CyTEA is an IATEFL associate and holds successful conferences every year, attracting local as well as international delegates. The lucky winner will receive 300 GBP to be used against any conference-related expenses (flights, accommodation, conference fee etc). We invite IATEFL LTSIG members to submit a proposal for a talk or workshop by completing this form. The accepted speaker will speak under the LTSIG banner. Prospective speakers are kindly asked to submit a proposal for a 30-minute talk or a 50-minute workshop. Speakers may only submit one proposal. Note: The deadline for applications is 16 August 2018 at 8pm BST. Prospective speakers need to indicate whether their session is a talk or workshop. The theme of the CyTEA annual Conference is “Embracing Change in ELT: Challenges and Perspectives”. This theme will allow ELT professionals from within Cyprus and guests from abroad to reflect on the importance of looking at our area of expertise from the perspective of a field which has matured over the years and has consolidated pedagogical and professional practices, but which is also in tune with the latest developments in education and is aware of the demands which the 21st century has imposed upon learners and teachers. Prospective speakers need to indicate whether they are speaking on behalf of a publisher or institution. Delegates are likely to be disappointed if a session they attended based on the description in the proposal turns out to be an advertisement for a publication, product, or course. If you are basing your session either in part or in full on newly or recently published material, you should clearly state this in your proposal. Full speaker guidelines and applications for this travel grant can be found on this document. More information about this event can be found on the CyTEA conference website, but please use the above link to submit your proposals for the travel grant. The Role of Artificial Intelligence (AI) in English Language Teaching, Learning and Assessment: Either Friend or Foe?